It turns out I was almost perfectly primed for Robert Redford's earnest new thriller, THE COMPANY YOU KEEP. I'd spent much of the year compiling playlists from Monterey, Woodstock and Altamont, as well as reading Thomas Mallon's superb fictional account of Watergate, and in doing so became fascinated with the politics of the time, the apparently high stakes, the desperation of the students being koshed at Kent State. What would it have taken to turn a liberal-thinking, frustrated student into a militant radical along the lines of Baader-Meinhof? This seems to be a fascinating question. If I ad been alive then, how would I have reacted? This isn't the first time I've been obsessed with this kind of practical historical moral dilemma. I've always wondered whether I and my friends, Oxbridge contemporaries, would've been tempted to spy for the Soviets when faced with the seemingly unstoppable march of European fascism. At any rate, for whatever personal obsessive reasons, THE COMPANY YOU KEEP found me primed. As the movie opens a middle-aged woman (Susan Sarandon) hands herself into the FBI, admitting culpability in a radical political bank robbery that took place in the 1960s. In doing so, she threatens the anonymity of her fellow radicals. The most prominent of these is a small town lawyer played by Robert Redford, who in a Bourne-like road thriller, has to evade the gaze of both the Feds and Shia LaBeouf's investigative reporter, as he races to connect with his former lover and fellow radical, played by Julie Christie. His road trip takes him across America and back through time, uncovering the complicity of cops and students alike. At times, Redford's ability to call in cameos from marquee name actors - Nick Nolte, Chris Cooper, Stanley Tucci - became a little distracting, but ultimately the clear lines and swift pacing kept me on track. Whether or not it was plausible that a man of Redford's age could successfully go on the lam as he did, I was hooked by the bait of the final meeting between Redford's mellowing father and his still-radical former lover. The final confrontation is essentially a talky set-piece, but I found it fascinating. I loved the genuine respect and even-handedness accorded to each side of the debate, but was all the more disappointed when that was undercut by the final choice of a main character. Ultimately, we are left with the question of whether familial concerns trump wider political concerns, and the movie clearly comes down on one side of this question. It is, then, a deeply bourgeois piece, and the worse for it. 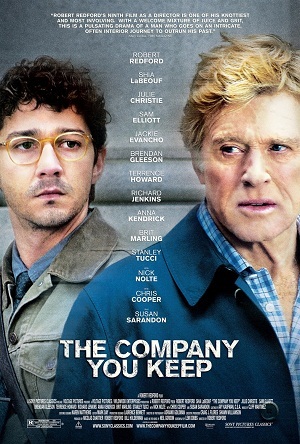 THE COMPANY YOU KEEP played Venice and Toronto 2012 and opened last year in Italy. It opened earlier this year in Sweden and is currently on release in the UAE and the USA. It opens next week in Israel and Portugal and on April 18th in Australia and Brazil. It opens on April 26yth in Finland, on May 2nd in New Zealand, on May 8th in Belgium and France, on May 23rd in the Netherlands, on June 7th in the UK, on June 20th in Argentina, on July 11th in Greece and on July 25th in Germany. The movie is rated R and has a running time of 120 minutes.